DEARBORN, MI—In a bold new series of print and television advertisements launched this week, the Ford Motor Company reportedly aims to appeal to consumers by touting the 2013 F-150 pickup truck’s ability to crush a large, full-grown turtle in a single pass. “The F-150 has always been synonymous with strength and dependability, and our newest model raises the bar even higher with its ability to squash a giant leatherback sea turtle in just one go,” Ford spokesman Walter Jeffries said at an outdoor press event as a professional driver steered the full-size pickup over numerous large reptiles, including a 130-year-old Galapagos tortoise. “We ask Toyota and Chevy truck owners to take Ford’s ‘Big Turtle Challenge’ at home or at Ford dealers nationwide. 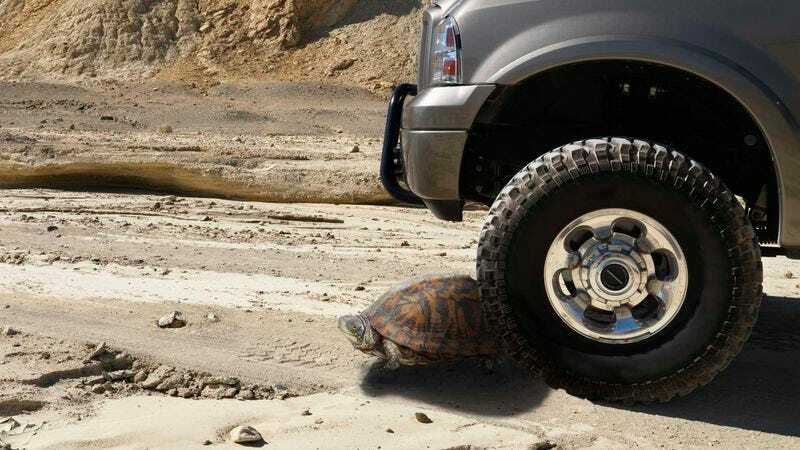 We think they’ll be surprised at the results.” Jeffries added that the F-150 features an electronic six-speed transmission and a payload that can hold 80 to 90 squashed adult terrapins.